I recently had the opportunity to spend several weeks reviewing the Dell Latitude 10 tablet PC. This is a business Windows 8 Pro tablet PC that is powered by the Intel Atom Z2760 dual-core processor @ 1.80 GHz. It comes with 2 GB of RAM and a 64 GB SSD. Overall, the device performs well and lasts up to 10 hrs (standard battery) for a mobile PC. If you need some serious computing horsepower, you'll want to get a PC powered by an Intel Core i5 or i7 processor. Productivity edition: Includes a removable battery, active stylus and HDMI. Mobile edition: Includes mobile broadband, removable battery, active stylus and HDMI. Security edition: Mobile broadband, fingerprint and Smart Card readers (along with removable battery, active stylus and HDMI). Removable 30Whr standard battery (up to 10 hrs) plus an optional 60Whr extended battery (up to 20 hrs). The extended battery adds some weight and bulk, but you won't run out of power all day. Full-size SD card slot (not found on most Windows 8 tablet PCs). Added security features of the fingerprint and Smart Card readers. 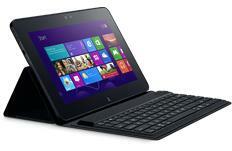 The Dell Latitude 10 Enhanced Security version is one of the thicker, wider Windows 8 tablets on the market. Given that it's designed for the Enterprise environment, it's made with a reinforced magnesium alloy frame. The tablet only weighs 1.47 lbs (the iPad weighs 1.46 lbs). The top portion of the Latitude 10 Security Edition is thicker (13.4 mm) than the rest of the tablet (10.5 mm) because of the integrated smart card and fingerprint reader. You'll want to get the Enhanced Security Soft-Touch Case that was designed specifically for this tablet. The 10.1" capacitive multi-touch HD display is crisp and bright. The Latitude 10 uses a standard-appearing Wacom digitizer pen for precise input and "inking," so if you're a traditional Tablet PC user, you can still go back to scribbling and jotting down notes. You won't find a silo for the pen on the tablet, so you'll need to carry the pen separately or use the case that has a built-in elastic loop for the pen. I wish that the Dell Latitude 10 also came with a mobile docking keyboard option that you 'll find on the Dell XPS 10 Tablet (which runs Windows RT). Instead, you can get the Kensington KeyFolio Expert case which has a wireless Bluetooth keyboard and hands-free stand, but this keyboard does not include a built-in mouse pointer. The Dell Latitude 10 is a great Windows 8 business tablet PC that gives the user flexible options with battery life and robust security features. The productivity dock allows you to connect a monitor and multiple USB peripherals so that you can have a workstation at your desk and a mobile tablet when you're walking around.